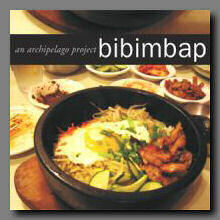 "Bibimbap" is only $20.00CAN plus taxes and mailing costs! a musical meal served up by a variety of artists from the Foundry label. Foundry Records' latest release "Bibimbap" is a wonderful concoction of artists paying homage to the Korean dish of the title by applying it's sense of discovery and change to a musical forum. Bibimbap (the meal) is a dish prepared by adding available ingredients to a stone pot of rice. As ingredients are added through the meal the rice takes on a different taste, a different form, until the end of the meal where one finds oneself with something markedly different from what they started out with. Applying this idea musically, the collected artists have used unfinished tracks, ideas, snippets and snatches of other work to create something new, vital and different. So let's see what's on the menu, shall we? "Amalgam" by Ben Swire opens the disc with a lush sense of environment, a song rich with beautiful pads and flavourful percussion fills that slip in and out of the piece with a charming flair. Saul Stokes adds "Cyclops Afternoon" to the pot, a slowly building track that bubbles and boils with small melodies and lovely arpegiated bits ultimately blending together into a rich sauce-y piece. Foundry head Michael Bentley offers "The Twilight pageant of the Bibimbots" a track staying true to his space music roots bringing together a variety of exotic ingredients. Delicate strains from distant stars bring a certain je ne sais quoi to the mixture while low deep tones unearthed from the spice mines of Arrakis provide a bass drone around which all else flows. A flavourful and rich meal indeed. Earwicker presents "Entree", ladling out swirling and undulating tones that rise and vanish like steam in the air. Other tones bubble underneath, a rich stew of sounds and expressions wonderfully blended together to create a very pleasant mixture. Chris de Giere's "Kimchi Tastes of Summer" is one of my favorite dishes, er, songs on this disc, with a selection of robotic burbles and squeeks tossed lightly with a base of rising and falling organic tones that underscore the metallic nature of the mix. Very nice indeed. "Muse of Expiration" by Thermal simmers with analog sounds oscillating wildly throughout, a full course of sounds ranging from beautiful light to harsh realms of noise. Very rich in substance and wholly satisfying. As always, Foundry brings together a wonderful collection of artists all of whom offer something unique and new to this very interesting compilation. A wonderful sampling of the artists on the label.